Knit for Peace is an initiative of the Charities Advisory Trust that encourages women (+men) from different, often historically hostile communities to come together informally to knit (or sew or crochet). With a shared common goal, differences in race, religion or caste are irrelevant, and individuals come together to knit peacefully. For groups, in developing countries, members knit for income generation. The Charities Advisory Trust, largely through the Good Gifts Catalogue, pays the knitters for jumpers and warm clothing, which is distributed by local charities to those in need. Brij Bhasin (right), the acknowledged guru of India handicraft, led the Indian Knit for Peace initiative, and through his enthusiasm, the project in India has developed. Firstly, he spread the idea of Knitting for Peace, and found partners to set up groups in Pakistan, Afghanistan and Nepal. These groups proposed not only to knit for their own poor children, but also in a true gesture of peace, groups in Pakistan would knit for children in India, and the Indian groups for the children of Pakistan. In late 2008, there was also an exchange of jumpers between Afghanistani and Indian groups. Formal presentations and ceremonies took place in Delhi and Jaipur, India. The number of Knit for Peace groups has grown and there are now groups in India and in the Swat Valley, Pakistan. At the Indo-Pakistan Peace Conference in Delhi, 2009, Knit for Peace was hailed as a very successful initiative. In Marenge, Rwanda, Hutu and Tutsi widows are coming together to knit. Through the Good Gifts Catalogue, groups are provided with the materials to knit. As well as the obvious social benefits, this offers the women the opportunity to earn a small income. We hold occasional Knit for Peace days in the UK. For example to celebrate Knit in public day a Knit for Peace group got together at London Zoo in June 2009 to knit items for the children of Afghanistan. It was a great day next to the gorilla enclosure, and we knitted lots of items to send to Afghanistan. We also reached out to new knitters and picked up some new tricks from others in the group. We held a Knit for Peace group at the Courtauld Gallery in conjunction with the Omega workshop exhibition in August 2009. 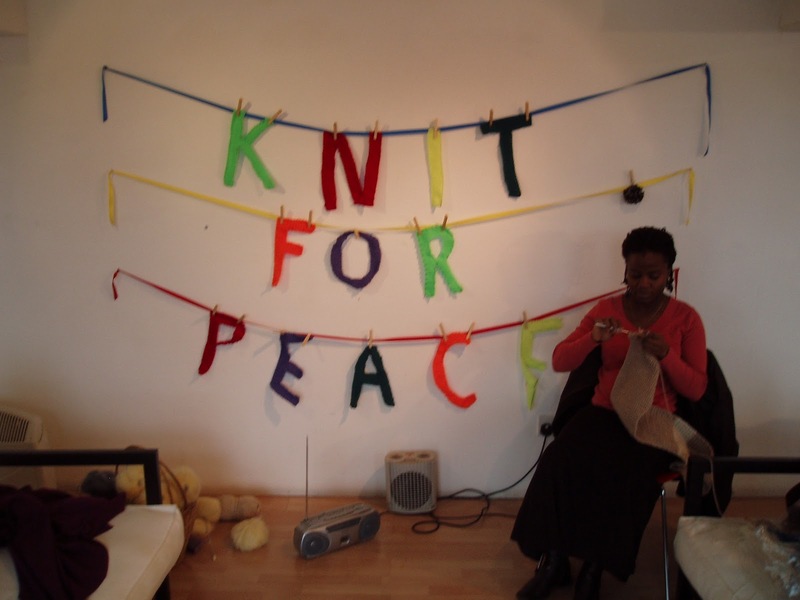 In December 2008, we held a Knit for Peace event at [email protected] on London’s South Bank. Individuals and groups of knitters send scarves, socks and other winter warmers for cold children in Afghanistan. The success of this initiative and the incredible support of many volunteer knitters clearly underline the potential benefits of this project. Please support Knit for Peace. We need warm knitted jumpers, hats, scarves, blankets and baby clothes for the children of Afghanistan. We are also grateful for knitting wool and needles. Please send them to Knit For Peace, Radius Works, Back Lane, London, NW3 1HL.